Did I not say that I would jinx things by mentioning that Isla was sleeping well, and that we’d turned a corner with putting her down in her cot!? She’s been bloody awful to get to sleep since then! And like last time, she stopped going down to sleep the night I posted about it! I’ve learnt my lesson now, never to mention how well she is sleeping! We’ve had to go out driving several times. I’ve tried the suggestion of giving her a comforter to replace the cuddling…she just threw it out the cot and it hit me on the head! Oh well, we’ll get there eventually! I’m enjoying the cuddles for now, but she’s getting big, and heavy! 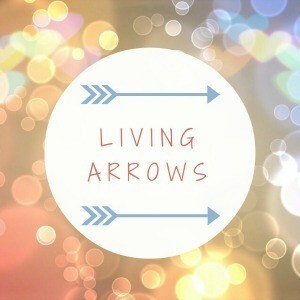 Anyway, it’s Monday, which means that it’s time for Living Arrows! So what has been going on with the weather this last week!?! One minute glorious sunshine, and then the next it is torrential rain! (Turns out our gutters need clearing out as they overflow – oh the glamour of home-ownership!!) It means that Isla and I haven’t managed to get out and about as much, as it’s just not fun playing on the park when it’s raining….or at least that’s what I tell Isla! On Tuesday evening we had some friends come over for dinner as we haven’t seen them in a while…and I think they were jealous when they heard our other friends in our little group had been round for dinner the week before! Isla was a bit slow to warm up to them at first, but then totally fell in love with Uncle Andrew and Aunty Fay, especially as Uncle Andrew let her eat half of his pudding! Food is usually the best way to Isla’s heart! 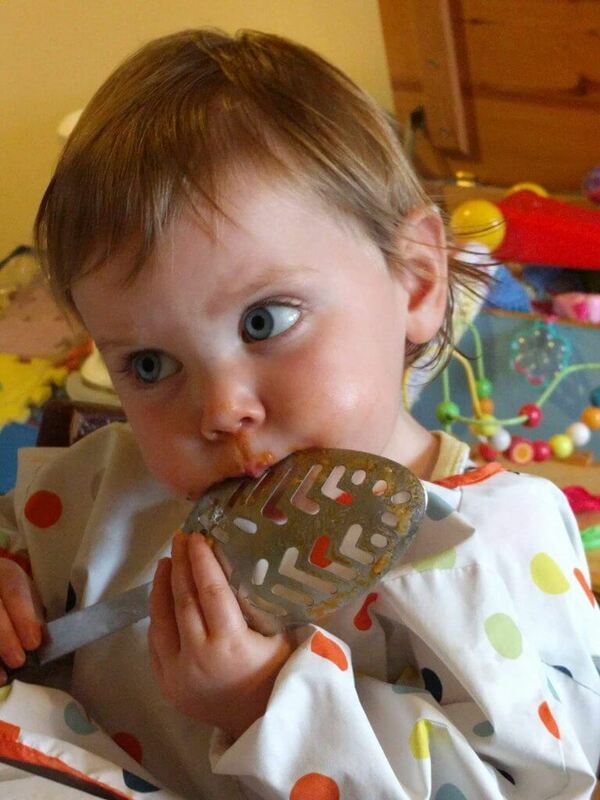 Isla has a total obsession with spoons at the moment. The more she has, the happier she is. And also the bigger they are, the happier she seems to be! 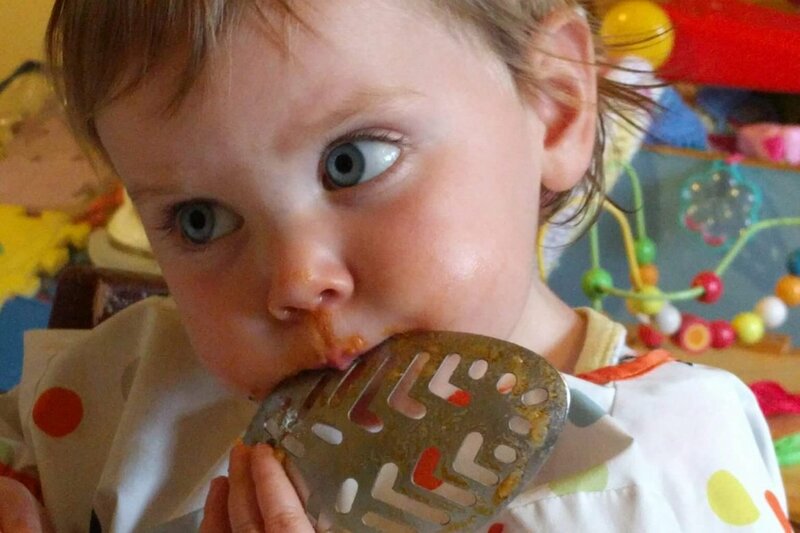 So imagine her delight, when Daddy let her eat the last bits of her dinner on Tuesday night with the serving spoon! THE biggest grin on her face…and then she tucked in! Turns out she really likes crispy chicken skin too! I love this photo of Isla from Tuesday night’s dinner. Food all round her mouth, on her nose, and a big spoon in her mouth! The concentration on her face, while she gets all the food off the spoon! Oh I love her so much! Going back to the topic of sleep, this last week has been horrific. Wednesday night Isla was sick in her cot…queue change of bedding, and pyjamas for everyone, and a quick hair wash too at nearly midnight! Fun times, with not much sleep that night. On Friday Isla also refused to have a nap at all in the afternoon, so she went to bed at 6:45pm, (2 hours earlier than usual), and so woke up at 6:30am on Saturday! Eugh! We’re not used to those times of the morning in our house! We all ended up having a 2 hour nap in the afternoon! Sunday afternoon Isla had a nearly 4 hour nap (like she did on Thursday too) and so struggled to get to sleep at night, so queue a drive round the local villages at 10pm!! And then she woke up for 2 hours at 5:30am! What is going on Isla Bear!?! There is not enough caffeine in the world right now! On the plus side of things, we managed to get the last of our leeks planted over the weekend, after we dug up a load more potatoes. And started to clear her side of our allotment plot – we still refer to it as ‘her side’. I think we probably always will! It just makes it easier to describe where things are on the plot! Unfortunately the rain then came, so we were cut short. What have you guys been up to this last week? Do your kids have a strange obsession with random objects? Yup! Isla loves the Sky remote too, and eating my phone! Aha – how cute! My little girl used to be obsessed with empty water bottles. She used to cuddle them in her pram to go to sleep – complete weirdo! Oh the sleep thing is a problem for us as well. Thankfully never had to resort to driving around… yet! Hope she’s ok after being sick. Midnight bedding changes are the worst! my 15 month old is obsessed with pulling the dvds and books out, some of daddies books are no longer being published so its a constant battle at the moment! We survived through molars the last 2 wks, thank god she’s settled back. It’s bloody hard!